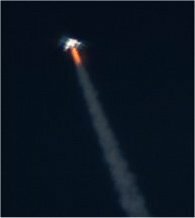 SpaceShipOne on first rocket powered flight Dec.17th, 2003. Bringing scramjets down to earth... Rand Simberg discusses the potential and serious limitations of scramjets, especially with regard to space launch: Overhyping Hypersonics? by Rand Simberg - TCS: Tech Central Station - Mar.31.04. Scramjets may someday provide an attractive option for launcher designs but we certainly don't have to wait till then to obtain low cost access to orbit. In fact, these projects sort of remind me of the efforts to make turbine engines for cars: they can be made to work but aren't very practical or low cost. Note: One significant difference between the Hyper-X and the previous scramjet flights by the Australians and Russians is that the Hyper-X involved an engine integrated into an airframe rather than just stuck into the nosecone of a rocket. 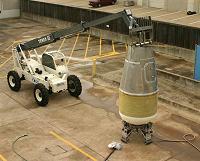 NASA tests aerospikes from Cesaroni Technology. See item in Advanced Rocketry. Rocket firing test success for the X PRIZE team Space Transport. They report (press release - doc file) that the "12-inch-diameter solid-propellant rocket engine", designed fo their Suborbital Tourism Vehicle (STV), burned for 14 seconds and " tipped the scales at the expected 12,000 pounds of force". They plan an unmanned test launch of the STV in May. Armadillo test... John Carmack reports in his latest update - Good warmup test - Armadillo Aerospace- Mar.28.04 - that the team carried out a brief firing of a complete set of engines on the test vehicle. These are the smaller engines that they will use for hover and low altitude tests. He says that " a hover test next weekend is a possibility, weather permitting." SpaceX makes the cover of Aviation Week... This article - The SpaceX Falcon Will Challenge Orbital Sciences and Boeing By Craig Covault - Aviation Week - Mar.28.04 - will get the attention of those companies and the rest of the aerospace industry. Pratt & Whitney will supply RL10 hydrogen/oxygen engines for the second stage of the Falcon V.
The RL10 version of the upper stage will put 20K-lb into LEO or 10K-lb into GTO for $20M. Delta IV prices for such flights would be around $60-80M. The Falcon V is aimed for eventual manned missions and will use man-rated avionics and other components from the start. The company has had "formal discussions with NASA" on ISS crew flights for "later versions" of the vehicle. A couple of short sidebar articles, not accessible without an AW&T subscription, discuss the implications of the Falcon to the military and why the SpaceX approach is offering lower costs. One big advantage is that SpaceX is self-financed. Elon Musk says the cost of "the Falcon development remains under $100 million" and he has reserves to sustain up to two failures. If the first launch goes OK, he hopes to attract outside capital in the $50-100M range. X-43 test success... I watched the launch via NASA TV and it appears that everything went quite well. They stayed in contact with the Hyper-X all the way till it hit the water. There will be a briefing on NASA TV at 4:00pm PST. Congratulations to the X-43 team. X-43 flight appears to be on schedule for today according to this report. See also this NASA page. The Rocket Company flies its first stage for the first time. X-43 updates can be found here. Coverage at NASA TV begins at 12:00pm PST. The flight is at 1:00pm PST. News briefs ... The X-43A flight is still on schedule for launch tomorrow: 5,000 mph jet ready for test flight - CNN - Mar.25.04 * Speed Demon (X-43) - Economist.com - Mar.25.04. ISS tourist ... Keith Cowing reports that Space Adventures will announce on March 29th that it has arranged a tourist flight to the ISS this October for Gregory Olsen, president and CEO of Sensors Unlimited Inc. The open project approach... John Carmack from the beginning of Armadillo Aerospace has posted detailed updates and hasn't been reluctant to report on setbacks and mistakes. It has been great to follow the progress of the project. It should be require reading for aerospace engineering students so they can see something of the real world process of encountering problems and overcoming them. Elon Musk at SpaceX doesn't do a weekly log but his monthly reports do give fairly detailed accounting of hardware development. In a completely different technology, CarterCopters provides a detailed accounting of the company's development of an innovative high speed gyroplane. For example, see this account of a demo flight in front of some military VIPs that went perfectly until the landing without the gear deployed. It would be great if more technology development projects followed this open, inclusive approach. Many will cite the need to protect proprietary techniques and technologies but in fact for many projects the sensitive stuff can just be left out of the updates and avoid any loss of intellectual property. I notice today that Eclipse Aviation, which is developing a low cost ($1M) business jet, has decided to provide a regularly updated, interactive timeline - Eclipse Aviation: Track Our Progress - showing the tasks and milestones needed to reach certification by 2006. While it's not exactly a weekly log, it shows that even a company with a high budget commercial project in a competitive industry feels it can reveal a lot more about the project's status without giving away any secrets. Commission transcripts... The testimonies of Musk, Diamandis, and Greason at yesterdays session of the Aldridge commission is not yet posted on the commission website. However, you can find Jeff Greason's transcript at: XCOR CEO Jeff Greason full written testimony for Presidential Commission on Moon, Mars and Beyond - XCOR - Mar.24.04. The page also includes some video clips of his presentation. Peter Diamandis's testimony is available on this doc file from the X PRIZE site. Reaction Rockets... Via a newsgroup posting I found this set of recent papers by Alan Bond (of HOTOL fame) on his Reaction Engines web site. Last I heard, they had gotten a bit of money to do further hardware prototyping of the precooler (pdf) for their Sabre engine. The Skylon design looks clever and might very well work. However, he would need a few billion pounds to find out andEngland is not likely to give him the money. Alt.space meets the space commssion... I thought the entrepreneurial gang of three -Elon Musk (SpaceX), Peter Diamandis(X PRIZE) and Jeff Greason (XCOR) did an excellent job today when they testified to the President's Commission on Moon, Mars and Beyond. The fact that all three reported on real hardware development - Falcon I, EZ-Rocket, and the various X PRIZE projects - gave their testimonies real weight. Hard to judge these things but I think they made a big impact on the panelists. If you didn't have a chance to see the session, I strongly recommend watching the videos when they are posted in the commission's archive. Reused RLV criticisms... James Wertz of Microcosm has an editorial in the latest issue of Space News that blames the "search for a reusable launch vehicle [for] stifling the development of true low-cost, responsive access to space." He presents arguments similar to that in the paper Economic Model of Reusable vs. Expendable Launch Vehicles (125k pdf) from 2000. Basically he says RLVs will be more expensive than cheap boosters like his Scorpius system because they will not fly frequently enough to pay back their high development costs, their operations costs will be high, and their payloads will be smaller than ELVs for the same takeoff weight. He cites the shuttle as his primary example of the high development and operations costs for RLVs. I certainly agree that if an RLV flies at the same rate as a typical ELV system, it won't offer much improvement in cost. However, the whole point of the current RLV efforts, at least in the private sector, is to build systems that CAN fly frequently. That is, they will not require shuttle type of major refurbishment between flights. There is a certain Catch-22 in all of this or at least a bootstrapping challenge. You need a high flight rate to justify RLVs but he is saying don't build them until you have a high flight rate. The suborbital RLVs will help to overcome this challenge by starting with low cost systems, low operational costs, and develop high flight rates with space tourism and other applications. Gradually they will work towards orbital systems. Wertz notes the suborbital projects but cites the huge step they need to take from "Mach I to Mach 25". (More like from Mach 4 actually.) I'll point out in turn, that for 2-stage systems, it's not such a huge step for a suborbital to provide the first stage platform for an orbital expendable or reusable stage. Regardless of whether RLVs are the best approach, as a HS reader says, "most of the reusable research is being done by PRIVATE MONEY. How does that "stifle" anyone?" Fully reusable launch vehicles seem to be off the table at NASA for the near term. I suppose one could argue that the money wasted on the X-33, X-34, etc. would have been better spent on cheap dumb boosters but it could have also been better spent on better RLV projects. I fully agree with Wertz's concluding recommendation that Congress fund a range of low cost demonstration launcher projects, ranging from ELVs to partially and fully reusable systems, and see which best fulfills the needs for cheap access to space. May the best launcher win. Elon Musk (SpaceX), Peter Diamandis (X PRIZE) and Jeff Greason (XCOR) are first on the agenda. It will be broadcast/webcast live on NASA TV. Later the videos can be found in the commission's archive. Armadillo engine progress... John Carmack reports in his latest update that they have now overcome various problems in getting reliable ignition and performance from their engines: Working engines - Armadillo Aerospace - Mar.20.04. "We have all the materials to put together a ship set of engines with the new design, so we are shooting for another full vehicle warmup test next weekend. If that works, we will be aiming for a hover test the following week." NASA/Military space trans... The House Subcommittee on Space and Aeronautics heard testimony yesterday about the status of collaborations between NASA and the military in development of space transportation. Jeff Foust reports on highlights of the House space transportation hearing - Space Politics . Starting next year NASA intends to offer prize money to encourage entrepreneurial companies to develop various "Fundamental Space Technologies" useful towards expanding the access to space. The program appears to be closely modeled after the X-Prize and the DARPA Robot Challenge and satisfies to some degree the calls by the Alt.Space movement to engage small commercial space start-up companies. [An article in Space.com] states that the prize money next year available is $250K per challenge and has narrowed down the list from 129 to 15 candidate challenges. I certainly encourage this idea and believe it is long over due! If it has half the effect of other competition prizes, it will give direction to many of the small start-ups companies towards useful technologies with the goal of Cheap Access To Space (CATS). Not to make a big point of this, I wonder why the Alt. Space community wasn't directly asked for input from their point of view as to what challenges might be practical? Originally I was hearing thoughts about offering an award for accomplished goals such as; A probe to Mars, the Moon, an Asteroid; A satellite, payload in orbit; A supply capsule to the Space Station; Crew Escape Capsule for ISS and the like. Clearly a $250K prize would be insignificant as motivation to pursue these targets considering the X-Prize is a 10 Million award for manned sub-orbital space flight! Considering that with very few exceptions, no X-Prize or Sub-Orbital Team has launched a rocket to 100K feet and absolutely no one has launched a rocket to space (100 ilometers), What challenges are actually attainable within a few years with a $250K prize as motivation? Looking at Rutan's SS1 X-Prize vehicle as a model for a successful program, we have a company with 100 employees, the most famous aeronautical engineer alive Burt Rutan, as well as the third richest man in the world's 20 million dollars, all to win a $10 million dollar prize. So NASA would get a 2 to 1 cost advantage and the benefit that it only pays upon successful completion. A great deal if you ask me! I don't expect any body will be making a significant profit with a $250K prize, but I do know from experience that it's enough to "boot strap" a small team of rocket enthusiasts into potentially a real space business. For this to be worthwhile long term to the CATS concept, it needs to be a real business, with a business plan, real life things like a product and real life expenses like overhead & salaries. Again, long term, a bunch of volunteers working out of someone's garage isn't going to "Open the Frontiers of Space", but it could plant the seeds of change. Demonstrate true re-usability by flying twice in 24 Hrs. All technologies demonstrated should be scaleable towards human space flight. Banning bashing private spacers... The head of the NASA union that published the diatribe against commercial suborbital spaceflight (see below) has sent a nasty letter to Keith Cowing about his comments (see NASA Watch.) This is all rather funny, but as Keith points out, it hardly seems proper to use government property to attack a private publisher. It also brings up the serious topic of the brother-in-law effect commonly cited by space startup companies. A potential investor initially shows great enthusiasm and seems ready to write a check but a few days later backs off after talking to a brother-in-law or other contact who works at NASA. The NASA person typically knows little about the project but bashes it anyway and influences the investor against it. I've heard that the military has rules forbidding employees from expressing any such personal judgments about commercial products of possible military use because of potential conflicts of interest. Similar rules should be placed into the next NASA budget authorization. Projects canceled ... Jeff Foust reports that NASA will drop out of its collaboration with the Air Force on the X-43C hypersonic vehicle program and it will also end the development of the reusable RS-84 RP-1/LOX engine: NASA cancels technology development programs - spacetoday.net - Mar.19.04. Not too surprised by the X-43C decision. The military seems increasingly enthusiastic about hypersonic missiles so they can carry on with the R&D in this area. I am disappointed with the RS-84 cancellation. Seems like it is the kind of expensive technology development that NASA should be doing. However, as Rand Simberg mentioned yesterday in a different context, NASA seems to have decided that RLVs are decades away. Now they seem to be trying hard to fulfill that belief. Suborbital bashing ... Keith Cowing at NASA Watch handily dispatches this oddly strident attack on suborbital RLV projects by a NASA employee: A Word from the Know-Nothing Bureaucrats - LESA BULLETIN 2004-002: IFPTE LOCAL 28/SpaceRef - Mar.19.04. I don't want to to get worked up about such silly bombast. Rutan and the rest will let their vehicles speak for themselves. I will note this quote:"There is no reason anyone would want a computer in their home.” – Ken Olson, President, Chairman and Founder of Digital Equipment Corporation, 1977. And that we seem to be in phase two of Arthur C. Clarke's Law of Revolutionary New Ideas. Space Transport update... The X PRIZE team Space Transport says in their latest update (doc file) that in early March they launched a 3 stage sounding rocket in an attempt to reach 100km. However, "[in-flight] vibration evidently caused power failure, which ended communication with the rocket. Locating the landed rocket is extremely difficult in this situation". By the end of this month they plan "to conduct another three-stage rocket flight to near 100 km with camera onboard." They also had problems with the 12" rocket engines during tests but believe they understand the problem and will resume tests this month. The update includes a picture of a test of the 12" engine. Such engines will be used on their X PRIZE vehicle. "...detailed four-day flight preparation and training experience. The highly focused and inspiring pre-flight agenda will familiarize each passenger with the flight program, critical vehicle systems, flight operations, zero gravity conditions, in-flight accelerations, and space flight safety procedures. On launch day, flight specialists will assist the passengers in suiting up and guiding each through the final checklist. Each flight will be directed by both a skilled-pilot and a precise computer controlled system. As each vehicle reaches their maximum altitude, the rocket engines will shutdown and the passengers will experience up to five minutes of continuous weightlessness, all the while gazing at the vast blackness of space set against the blue horizon of the Earth below." Kistler down under... Another article about Kistler appears in the Australian press - NASA has high hopes for troubled rocket - News in Science - Mar.15.04 (via NASA Watch) - but it reports nothing beyond the known facts about Kistler's attempt to use the NASA contract to emerge from bankruptcy. New Mexico will fund X PRIZE Cup if it is chosen to host the rocket games. According to this article - New Mexico Aims to Be Location for Aerospace Competition - YellowBrix - Mar.10.04 - (via the X PRIZE home page), the New Mexico legislature recently allocated $9M for the competition on the condition that New Mexico beats out Florida for the event. In addition, it is reported that a "private company in New Mexico is considering a seven-figure cash prize [for] the runner up of the X Prize Cup." The Cup would take place at the Southwest Regional Spaceport, which lies near the White Sands Missile Range. The New Mexico Office for Space Commercialization is organizing the effort to be chosen for the competition. Note that, as implied by the Office's RLV page, the Armadillo Aerospace team will probably do their high altitude flights from White Sands. Starchaser updates... The British StarChaser X PRIZE team reports that their application to the Australian government to launch from the Woomera launch site has been accepted "as a basis of full Space Launch Licence application.". Space License Application 10th March 2004 - starchaser.co.uk - Commercial Space Access. They also have made progress with development of their Launch Escape System (LES) for their Thunderstar vehicle. The twelfth flight of SpaceShipOne. Objectives included: pilot proficiency, reaction control system functionality check and stability and control and performance of the vehicle with the airframe thermal protection system installed. This was an unpowered glide test. The photos page shows a picture of the rocket motor for flight 13p and of the airframe with the thermal protection system now installed. Since this test was flight "12g" (12th SS1 flight, glide mode) the "13p" indicates that the next flight will be powered. SpaceX update for Jan/Feb 04 is now available on line. The site also includes a reprint of the interesting article: Changing the Low-Cost Launch Game: SpaceX’s new blood has set out to revitalize an old business—and may succeed in altering the commercial space landscape permanently - Aerospace America - Feb.04. In particular, see the launch costs table at the bottom. These estimates include "costs for the launch vehicle, a nominal allocation for mission unique requirements, LV telemetry support, and launch site processing." Serious rocket business... Rocket Man, otherwise known as Mark Oakley, announces that he has taken a job with TGV Rockets and will soon move to Norman Oklahoma where the company is headquartered: TGV Rockets - Rocket Man Blog - Mar.11.04. You can tell that the suborbital RLV launch business is getting serious when people of Mark's caliber leave secure jobs at companies like LockMart to go work in this exciting new industry. Phoenix rolling... The German conglomerate EADS has carried out taxi tests of its mini-spaceplane prototype Phoenix in preparation for drop tests in May: PHOENIX final rehearsal goes well - EADS SPACE - Mar.10.04. This vehicle is only intended for atmospheric tests. It will provide data for the Hopper sled launched orbital vehicle, which, if approved, would launch in the 2020 timeframe. X PRIZE gets major sponsorship... The X PRIZE has obtained a major sponsor for the competition: Champ Car World Series to Sponsor X PRIZE $10M New Race to Space - X PRIZE - Mar.9.04. As part of the sponsorship, the Champ Car World Series logo will be placed on all X PRIZE spaceships and the series will be the primary corporate sponsor of the X PRIZE flights. In addition, Champ Car World Series co-owner Kevin Kalkhoven will participate as a spokesperson during attempts to claim the $10 million prize. Mr. Kalkhoven will also be joining the X PRIZE Board of Trustees. For more information on the Champ Car World Series please visit www.cart.com. This seems a perfect match. Car racing has long depended on sponsorships and they know how to keep sponsors despite the dangers involved and the occasional deadly accident. Sci-Am commercial launchers article... Joan Horvath of Takeoff Technologies and Global Space League has an article about the new private launch companies in the April issue of Scientific American: Blastoffs on a Budget - "Private ventures seeking to make access to space easy and affordable see a big potential in small vehicles." Furthermore, the issue's editorial is one of the few I've seen anywhere that gives a fair and informed view of the President's new initiative (i.e. it points out correctly that the big numbers cited for its cost are bogus). It says that if NASA cannot reform itself to implement the program efficiently, "the country should consider founding a new agency or a public-private partnership or even multiple organizations to stir up competition. The private sector can't do it on its own, at least not yet [cites Horvath's article]". Tuesday, March 9, 2004 - 7-8:15PM Pacific Time - Space Show features Henry Vanderbilt. Henry Vanderbilt figured out nobody was going to pay for him to go to space when he was six, watching John Glenn's flight on the black&white TV and someone mentioned that the rocket cost ten million dollars and they throw it away each flight. Nothing changed through the mid-eighties, when his ongoing intense amateur interest in spaceflight caused him to jump laterally out of a techy career into successive opportunities to write online about space and then to work in space politics. He immediately discovered that everybody had grand schemes about what to do in space, none of which first solved how to get there affordably, none of them thus ever going anywhere. He got involved in efforts to solve the transportation problem, continued to find that the ball was being dropped through lack of continuous focus, and finally ended up founding Space Access Society in 1992 for the sole purpose of promoting radically cheaper practical space transportation. He's run it ever since, putting out semi-regular Space Access Update newsletters and political alerts, and running the annual "Space Access" conference (best described as "Hackers" for rocket people). See http://www.space-access.org for more information and conference details for April 22-24, 2004. Mr. Vanderbilt will discuss the exciting state of affairs in space transport currently - new private startups all over the place, X-Prize on the home stretch, real alternatives to the NASA-Industrial complex finally starting to happen. Not "2001" yet, but significant steps in that direction. Maybe a quick look at the new White House NASA policy too; the reforms if carried through would be radical - all from the perspective of Henry Vanderbilt! Entering "final stretch". Most of the development on major components - engines, structures, avionics, etc - is now completed. A few weeks ago the first stage was installed in the test stand in Texas and filled with kerosene and liquid nitrogen (replacing LOX for safety reasons). The pressurization tests went just fine, validating their FEA models. The next major milestone is the first stage hold down test, which is a static firing of the complete, fully integrated first stage. "Should happen in the next four to six weeks." Regulators gave them "approval to fly the rocket with only thrust cutoff, rather than explosive termination."... "[This] improves hazardous procedures in transportation, on the launch pad and particularly on recovery of the first stage." This was allowed "due to the all liquid fuel configuration and six-fold valve redundancy." Kestrel upper stage engine reaches 96.4% efficiency and 327s Isp. Attaining "significant cavitation margin" on the liquid oxygen inducer/impeller in the turbo-pump for the Merlin first stage engine is the last big issue for the propulsion system. Extensive CFD processing being done on a 48 processor Beowulf cluster. Guidance system simulation tests look good over a broad range of Vandenberg weather conditions. There is a Falcon User's Conference coming up on March 25/26 in El Segundo for anybody interested in using the Falcon I or Falcon V launch vehicles. Contact Gwynne at gwynne.shotwell@spacex.com for an invitation to the event. Currently they are "on track for a maiden launch around the middle of this year." Though this is a bit later than their original goal of last December, it may still be within 2 years of incorporating, so this is no small feat. Suborbital advocacy... As noted by Andrew Case, the Suborbital Institute will launch another Suborbital Action Day campaign on Capitol Hill on May 17-18th. Participants will inform Congressional staff members about the nascent suborbital RLV industry and discuss issues important to its development. If you would like to participate, contact one of the organizers. Suborbital FAQ... Here's a set of Frequently Asked Questions about various aspects of commercial suborbital spaceflight that I worked on with help from Pat Bahn. If you have corrections, suggestions, additional questions for the list, etc., let me know. Commercial launch bill passes House... The Commercial Space Launch Amendments Act of 2004 gets House approval and goes the Senate: Space Bill Rockets Toward Congressional Approval - Washington D. C., Mar.4.04. The ride on a Archangel should be a thrilling one according to this chart. A Rocket Academy concept is being developed around these vehicles. The facility will offer a range of services that include space camp type experiences for the public, spaceflight adventures (i.e. riding the Archangel), professional level courses and training, a museum, flight opportunities for researchers, etc. "Lastest News: Maching Bird 1 has successfully completed a high-rate sortie test—four flights in under seven hours—helping to validate our high-flight-rate operating model for Archangel." I'm looking forward to the presentation by Ed Wright (chief of X Rocket) at Space Access'04. Assigns all commercial space flight regulatory authority, including authority over commercial human space flight, to AST. Allows AST to issue experimental permits for reusable suborbital rockets that can be granted more quickly and with fewer requirements than licenses. Requires that experimental permits allow an unlimited number of experimental flights for a particular vehicle design. Requires AST to issue regulations for crew relating to training and medical condition. Requires AST to issue regulations for space flight participants, but limits requirements to space flight participants being informed of the risks of their participation and providing written, informed consent. Requires both crew and paying passengers to execute mutual waivers of liability with licensees (or experimental permit holders) and the federal government. Extends the existing liability indemnification regime for the entire commercial space transportation industry (including licensed, non-experimental commercial human space launches) for a period of three years, but excludes launches performed pursuant to an experimental permit. Requires a study on how best to gradually eliminate the liability indemnification regime for the commercial space transportation industry by 2008 or as soon as possible thereafter. Authorizes to AST such sums as may be necessary for fiscal years 2005, 2006, and 2007. The Suborbital Institute web site has been updated. NASA exploration outline is provided in the Briefing Charts: NASA Associate Administrator Craig Steidle, Office of Exploration Systems - SpaceRef - .3.04, which links to this 3.5 MB Powerpoint file. The presentation also discuss the Centennial Challenge prize program. The program grew out of the 2003 NASA Space Architect study. Using input from the X PRIZE Foundation, they gathered 129 potential challenges and then winnowed them down to 15. From these they estimated the purse sizes and time scale needed. Studies were funded until recently by NASA's NASA Breakthrough Propulsion Physics (BPP) Project program. However, that program has now been shut down. Some companies such as BAE Systems seem to be continuing the studies at a modest level. The group at Quantum Fields is mentioned in the article. Although the article starts off dramatically, it really doesn't say much more than how great it would be if the ZPE reservoir could be tapped and that legitimate researchers are studying the subject. But there is no indication yet that it can be used in any practical way.